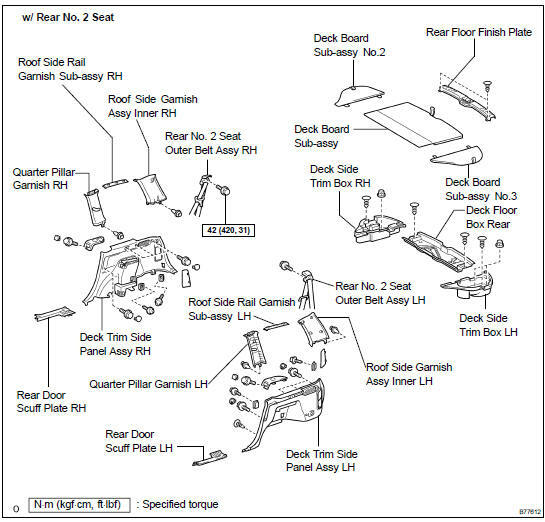 (a) Using a screwdriver, disengage the 5 clips, 2 bolts and deck board. (a) Using a screwdriver, disengage the 2 clips and remove the bolt and cover. (a) Using a screwdriver, remove the 2 clips and box rear. 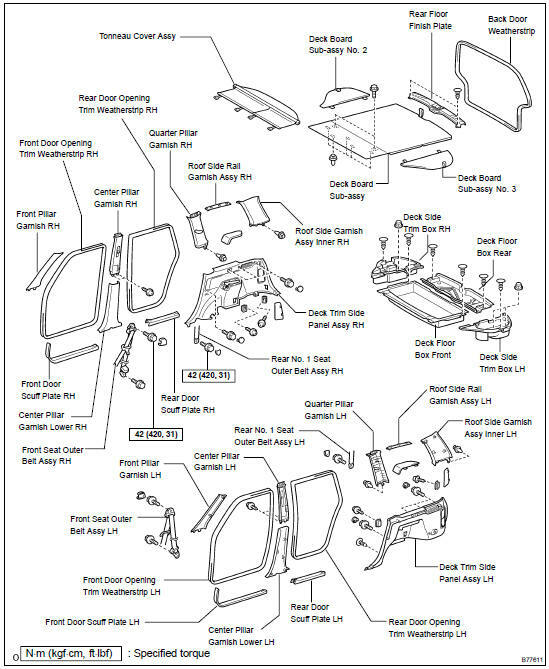 (a) Using a screwdriver, remove the 2 clips labeled A, 4 clips labeled B and finish plate. 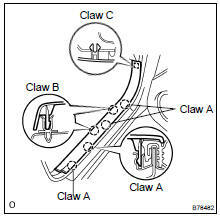 (a) Using a screwdriver, disengage the 4 claws labeled A, 2 claws labeled B, claw labeled C and remove the scuff plate. (a) Using a screwdriver, disengage the 2 claws and remove the scuff plate. (a) Using a screwdriver, disengage the 2 claws and remove the 5 clips and garnish. (a) Using a screwdriver, disengage the 2 claws labeled A and 2 claws labeled B, Remove the cover. (b) Remove the shoulder anchor bolt. (d) Using a screwdriver, disengage the clip and remove the garnish. (a) Using a screwdriver, remove the cover and screw. (b) Using a screwdriver, disengage the 2 claws and remove the trim box. Remove the 5 bolts and rear seat outer belt floor anchor bolt. Using a clip remover, remove the 6 clips and side panel. (a) Using a screwdriver, remove the clip labeled A and clip labeled B and garnish. (a) Using a screwdriver, disengage the 3 clips and remove the 3 claws and rail garnish. Using a screwdriver, remove the 4 clips and side garnish. Using a screwdriver, remove the 4 clips labeled A, clip labeled B, remove the side garnish. (b) Pull the garnish upward and remove it from the instrument panel. Using a screwdriver, disengage the clips clip labeled A and clip labeled B. (d) Remove the pillar garnish. 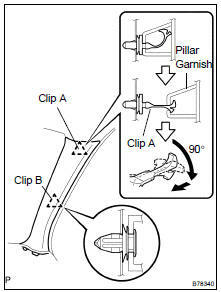 Pull the pillar garnish until the clip marked A in the illustration stretches. Turn the clip marked A in the illustration 90 degrees and remove the pillar garnish. (e) Protect the curtain shield airbag LH. Cover the airbag with cloth or a piece of nylon approximately 700 mm (27.56 in.) x 120 mm (4.72 in.) in size. 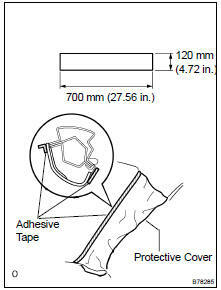 Fix the ends of the cover with tape as shown in the illustration. 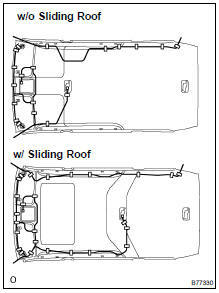 NOTICE: Cover the curtain shield airbag with the protective cover as soon as the front pillar garnish is removed. (a) Remove the 2 screws and visor. (b) Using a screwdriver, remove the 2 clips. (a) Using a screwdriver, disengage the 2 claws and remove the 2 clips and lamp. (a) Using a screwdriver, remove the assist grip plug. (a) Remove the holder of the sun visor by turning it to the left. 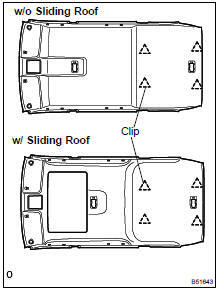 (a) Using a clip remover, remove the 4 clips and roof headlining. (b) Remove the headlining from the back door. (a) Align the markings, and then install the wire harness with tape. NOTICE: Attach the roof wire harness securely. 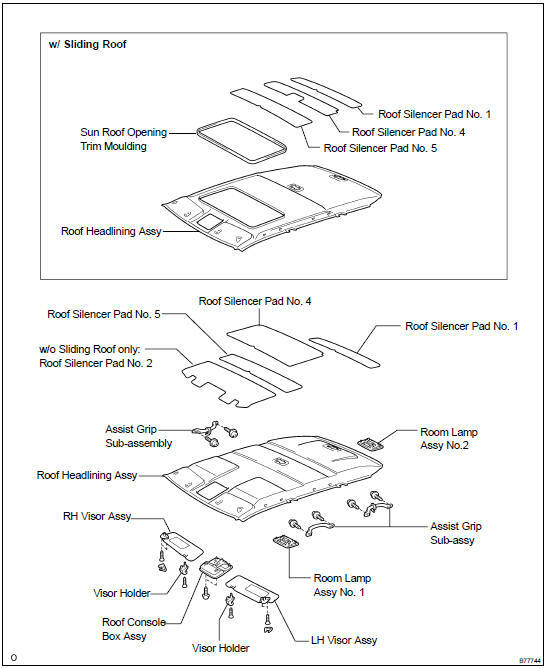 (b) Install the roof headlining with the 4 clips. (a) Install the rear No. 2 seat outer belt shoulder anchor with the bolt. 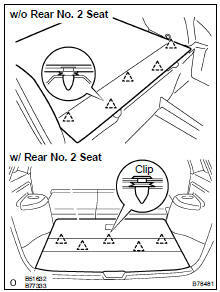 (a) Install the rear seat outer belt floor anchor with the bolt. (a) Install the front seat outer belt shoulder anchor with the bolt.